The malpositions in the frontal plane are the various forms of reverse articulation or transverse malocclusions, when the dental arches are deformed in the transverse direction and cross over in occlusion. These occur both as localized occlusal variations and as symmetric anomalies. Reverse articulations are usually symptoms that accompany other forms of dysgnathia and rarely occur in isolation. The term reverse articulation is generally used to denote a malocclusion in the area of the posterior teeth, when the mandibular posterior teeth have migrated in a vestibular direction and do not lie in their normal cusp-fossa relationships. This reverse articulation of the occlusion of the posterior teeth may be bilateral or merely unilateral (Figs 5-39 and 5-40). 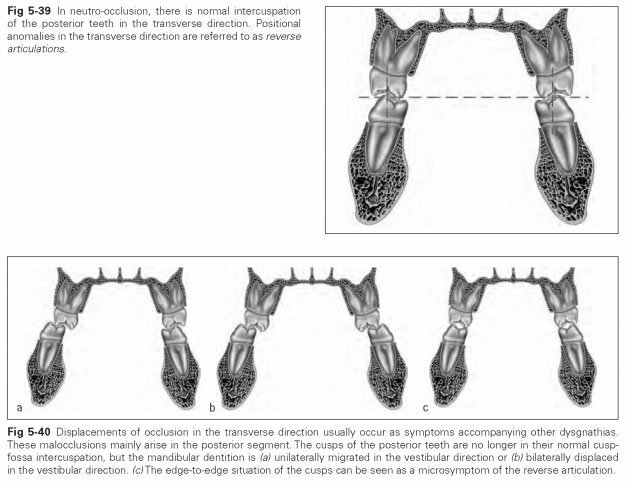 Bilateral reverse articulations are symmetric anomalies that arise when there is overdevelopment of the mandible in the transverse direction; in this case, the mandibular posterior teeth occlude over the maxillary posterior teeth vestibularly. Unilateral reverse articulations are asymmetric deformations of the jaws. They can be caused by deformation of the temporomandibular joint (TMJ) or by forced guidance of individual groups of teeth. 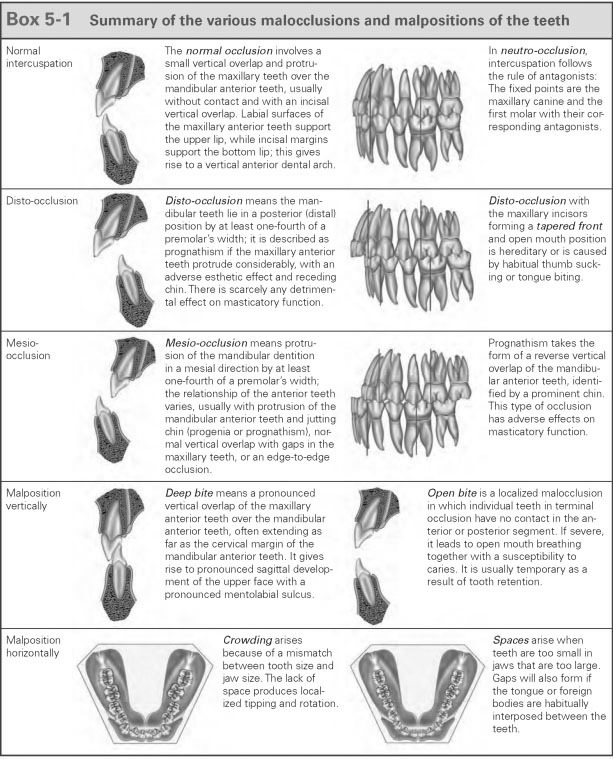 The malposition of groups of teeth can give rise to reverse articulation situations, such as the reverse vertical overlap of prognathism or crowding in the anterior and posterior segments. If the dental arches have been displaced as a whole in relation to each other because of exogenous factors, there may simply be a reverse articulation situation in the anterior region, but the malposition is found in both halves of the jaw. Lateral forced guidance usually causes displacements in the lower face, such as the middle of the chin deviating to the side. Otherwise there are no striking extraoral symptoms of the reverse articulation. The causes of reverse articulations are mainly linked to causes of the accompanying forms of dysgnathia. Congenitally narrow jaws can create natural reverse articulation situations as much as hereditary malpositioning of groups of teeth; while the former produces a bilateral reverse articulation, a unilateral anomaly can occur with the latter. A unilateral reverse articulation can develop because of thumb sucking if this causes one-sided compression in the mandible. Asymmetry of the head and the TMJs due to disease should also be considered as possible causes of a reverse articulation. In the frontal plane, malpositioning of the teeth can occur in the vertical direction as localized malocclusions, where certain parts of the dentition have no antagonist contact in terminal occlusion or where segments of the dentition are lengthened beyond the occlusal line. A distinction is made between the open bite and the deep bite. An open bite exists if a few teeth do not come into occlusal contact in terminal occlusion because they do not reach the normal occlusal plane (Fig 5-41). The open bite can affect both anterior and posterior teeth. If the teeth are still erupting, the open bite is only temporary. The open bite in the anterior segment can be seen directly by gaping of the incisal margins. An open anterior bite is often accompanied by sagittal tipping of the anterior teeth in a labial or lingual direction if thumb sucking is the cause of the anomaly. In severe defects, the mouth is often held in an open position, which leads to increased mouth breathing and thereby a change in the bacterial flora in the mouth and a susceptibility to caries. Deformation of the periodontium may also be expected where teeth have no antagonists. Severe forms of open bite will impair biting function and general masticatory function. They impede swallowing because the labial closure of the oral cavity is absent (lip incompetence); speech defects may also arise. Sucking fingers and other objects, tongue thrusting, and lip biting. These bad habits can lead to an open bite. The nature and duration as well as the intensity of the habits determine the severity of the occlusal deformation. Not everyone with a long-standing sucking habit will develop an open bite.The open bite is made worse if biting on the sucked object predominates during sucking. Rickets caused by vitamin D deficiency. This affects the mineralization of bones and hard dental tissue and can lead to softening of the bone. The reduced resistance of the bone to muscular impact produces growth disturbances. In the dentition, the mandibular anterior dental arch is flattened and the maxillary anterior sections bend, even in response to moderate sucking. Mouth breathing.This often leads to narrowing of the maxillary dental arch, anterior crowding, and growth impairment in the anterior alveolar region. Inheritance of a particular cranial structure and skull development.This can lead to an open bite with a receding profile and open mouth breathing. An open bite in the posterior segment exists if individual or several pairs of antagonists do not make contact in the anterior region when vertical overlap conditions are normal. This deformation of the dentition is not noticeable extraorally, even if it occurs symmetrically on both sides. This defect can arise as a result of a skeletal growth anomaly where the posterior segment of the mandible is more developed than the anterior. The habit of interposing the edges of the tongue can produce a lateral open bite. A deep bite means that the incisors overlap the opposing teeth by more than 3 mm (Fig 5-42). The functional disadvantages of this defect are that mandibular movement is impaired (chopping masticatory pattern) and strain is placed on the periodontium if the mandibular incisors bite into the gingiva. A deep bite is rarely found in the posterior region because extreme reverse articulation situations would need to be enforced for the broad masticatory surfaces of the molars to be able to glide past each. The deep bite, as a vertical malocclusion, occurs if both anterior pairs of opposing teeth have erupted beyond a theoretical occlusal plane. Whereas in a vertical overlap the overlap arises from increased steepness of the dental axial inclination, in a deep bite there is lengthening of the maxillary incisors, and the mandibular anterior teeth touch the palatal mucosa. Otherwise, the deep bite may exist as a secondary symptom of a vertical overlap. A deep bite situation also exists if the patient has to bite down deeply out of the physiologic rest position to achieve the terminal occlusal position, ie, when the interocclusal distance is very large. A deep bite arises because of a lack of contact between the incisors at eruption, which is accompanied by lengthening of the alveolar areas in this region. 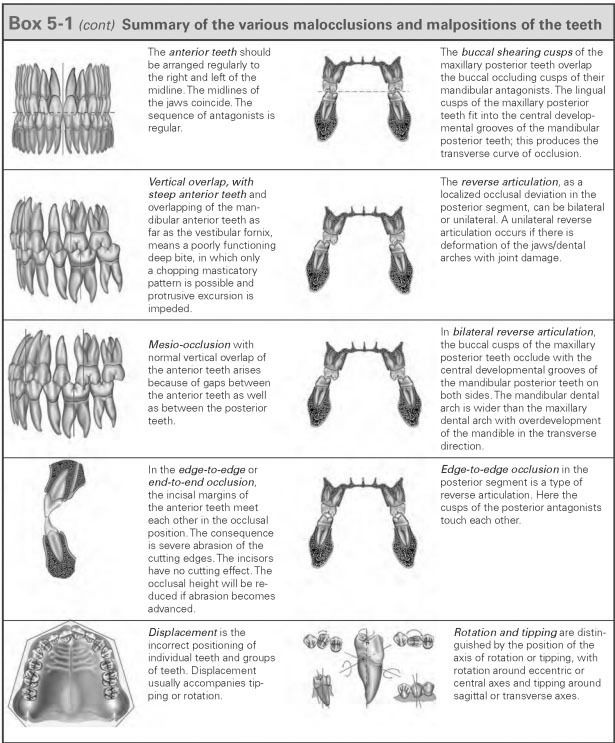 Box 5-1 summarizes the various malocclusions and malpositions of teeth.